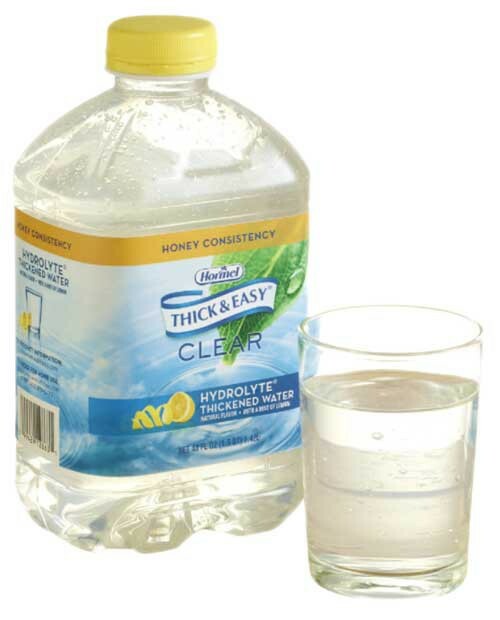 Thick & Easy Thickened Drink Beverages are Pre-thickened Beverages that are ready to serve and consume.Thick & Easy Thickened Drink Beverages are designed for patients with dysphasia or swallowing disorders. 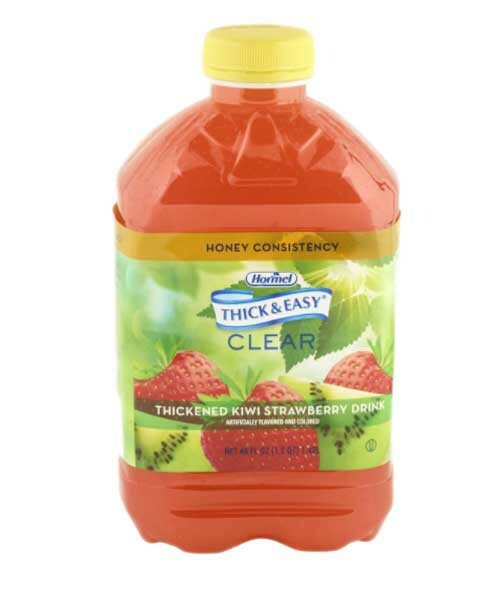 Fortified with vitamins and minerals, Thick & Easy Thickened Drinks come in 4 ounce and 48 ounce containers. Serving size is 4 ounces. 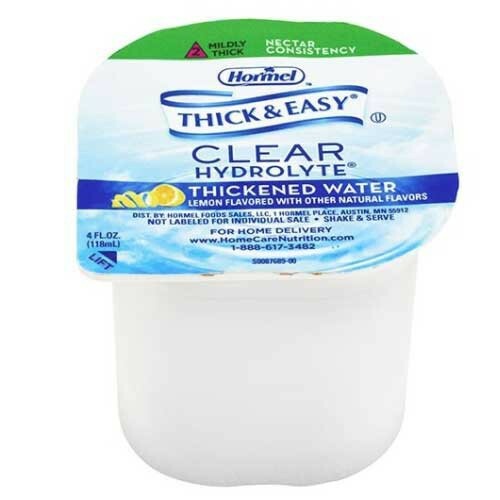 Each serving size provides the full recommended daily requirement for Vitamin C. Thick & Easy Thickened Beverages 4 ounce serving cups have an easy-peel barrier seal that is easily removed minimizing spills. The 48 ounce container is easily resealed for future use and comes with a built-in handle for pouring ease. This larger container has a durable translucent barrier that extends shelf life, color and vitamin efficiency. 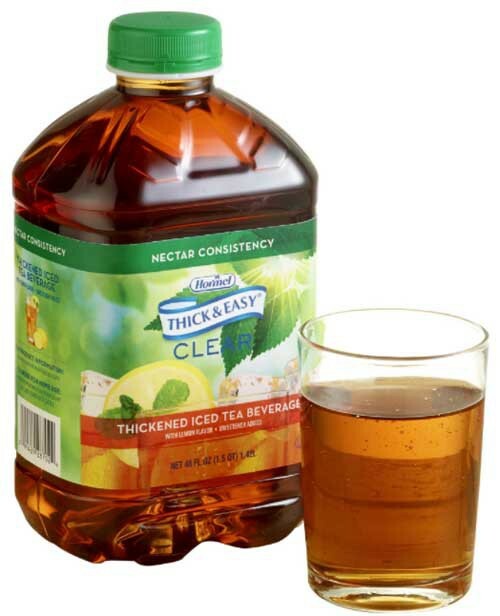 Thick & Easy Thickened Drink Beverages are available in 7 fruit flavors and two consistencies—honey and nectar—to meet the preferences and needs of individual patients. 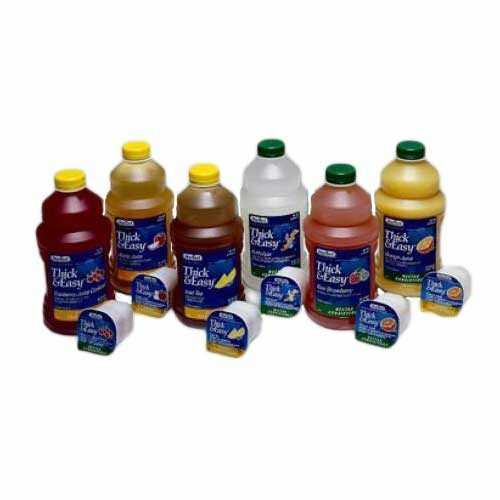 Manufactured by Hormel Health Labs, Thick & Easy Thickened Drinks provides reliable consistency with every serving that patients and caregivers can depend upon. 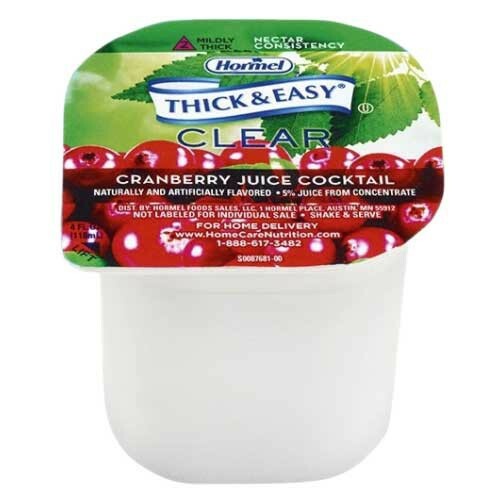 Thick & Easy Thickened Beverages release 98% of its available fluid after consumption. Available in two consistencies: Honey or Nectar. Provides 100% of the recommended daily allowance for Vitamin C.
Reliable consistency with every serving. Product Numbers: 11840, 12687, 12863, 15813, 20160, 23061, 27076, 27930, 28259, 28702, 28876, 30634, 32192, 32870, 39705, 40123, 41530, 42161, 45587, 46056, 49144, 66008, 66009. Size Options: 4 Ounce or 40 Ounce. Consistency Options: Honey or Nectar. Flavor Options: Kiwi Strawberry, Apple Juice, Lemon Water Hydrolyte, Cranberry, Iced Tea, Orange and Prune. Kosher: Circle U, Triangle K.
Shelf Life: 9 months unopened. The products I've used have been great in all areas of Quality and Price. I have had the greatest service with customer service and shipping which has been great. I purchased this product for my brother and he has been very pleased with it. It has a good flavor and is much more convenient than having to mix his beverage each time he wants to drink something. Love the easy-peel barrier seal and the built-in handle. The seal is easy to remove and easy to reseal. The built-in handle makes it easy to pour.